and they realized ­Jesus had not gone with them. boats and went across to Ca­per­na­um to look for him. if you want us to believe in you. What can you do? flesh to eat?” they asked. way, anyone who feeds on me will live because of me. 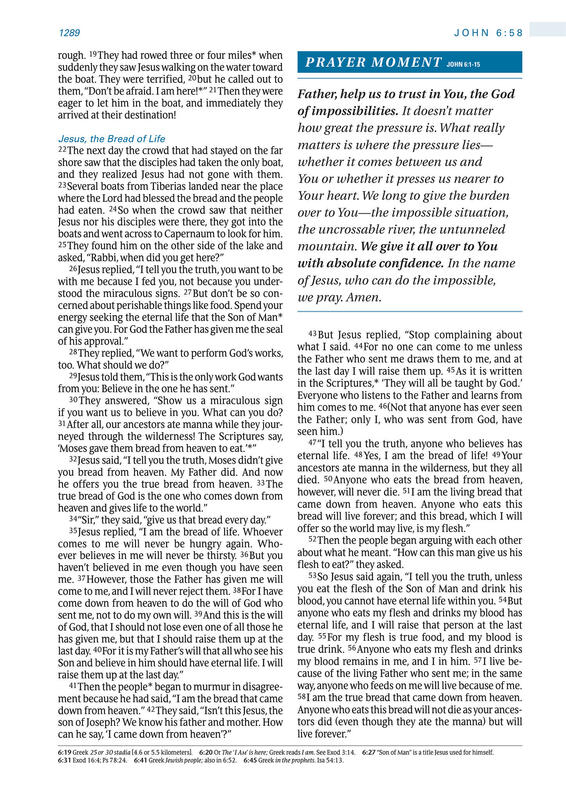 58 I am the true bread that came down from heaven. 6:19 Greek 25 or 30 stadia [4.6 or 5.5 kilometers]. 6:20 Or The ‘I Am’ is here; Greek reads I am. See Exod 3:14. 6:27 “Son of Man” is a title Jesus used for himself. 6:31 Exod 16:4; Ps 78:24. 6:41 Greek Jewish people; also in 6:52. 6:45 Greek in the prophets. Isa 54:13.